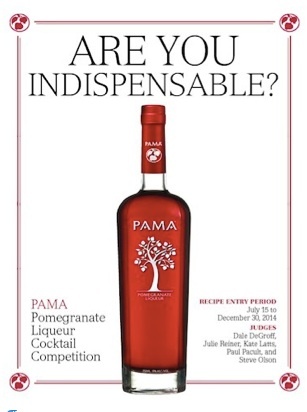 PAMA Pomegranate Liqueur, the original, all-natural pomegranate liqueur, today announces the second annual “Are You Indispensable?” Cocktail Competition. The competition is open exclusively to professional bartenders and mixologists who submit recipes via www.shakestir.com/PAMA. Cocktail recipes will be accepted from July 15 to December 30, 2014. Six finalists will compete in New York City for a Grand Prize of $5,000, a second place prize of $2,000 and a third place prize of $1,000. The competition will showcase the limitless versatility that PAMA brings to bartenders that makes it the indispensable modifier. Its ruby-red color, delicate sweet-tart flavor and silky texture turn ordinary cocktails into unforgettable ones and transform bartenders into bar stars. The competition’s partner is ShakeStir.com, a leading online community for bartenders and mixologists. It is hosted byHanna Lee Communications, Inc., an award-winning agency specialized in spirits, food, wine, and lifestyle PR and social media marketing. Editor’s Note: Please click here to see highlights from last year’s competition. The original, all-natural pomegranate liqueur, PAMA is the indispensable modifier that brightens cocktails and elevates them from the everyday to modern classics. By providing a delicately balanced sweet-tart flavor, silky texture and a vibrant ruby-red color, PAMA mixes exceptionally well with all spirits, both clear and aged, in cocktails ranging from aperitifs to nightcaps. PAMA’s unmatched versatility helps transform aspiring home bartenders and seasoned mixologists alike into bar stars. For more information, please visit www.pamaliqueur.com and www.pamapros.com, “like” us on Facebook at www.facebook.com/pamaliqueur and follow us on Twitter at @PAMAPros.